The Stihl RE 119 is a compact cold water high pressure cleaner with 125 bar operating pressure. Fitted with trolley and telescopic handle for easy transport and storage. 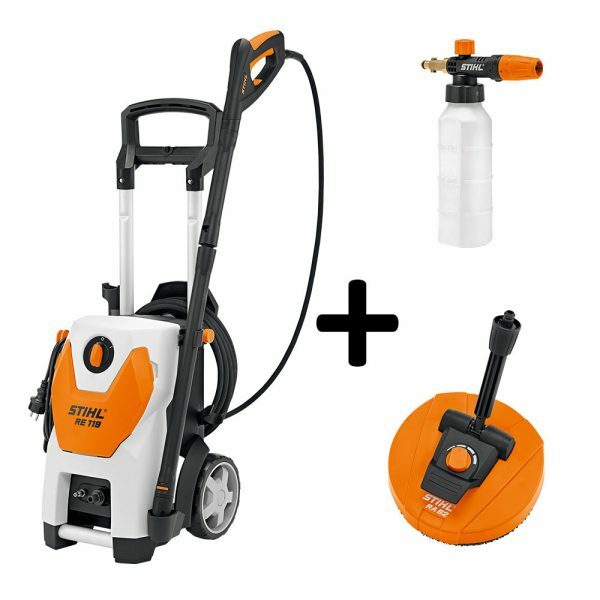 Hose and swivel power cable holders, rotary and fan jet nozzles and a detergent spray set all come as standard, with practical integrated nozzle storage too. With steel-reinforced 8m high pressure hose. Maximum water throughput 500 l/h. All STIHL pressure washers come with a 3 year domestic warranty.